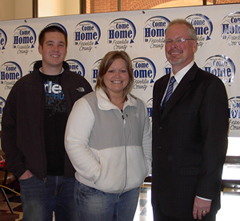 Joel & Stephanie McWilliams "Come Home to Franklin County" participants with Brad Davis, Hampton State Bank president. The president of a north-central Iowa bank says their incentive program to bring people back to the community has paid off — and they will extend it. Davis says they set aside one-million dollars in below-market loans in the hopes of enticing people back to Franklin County. He says they focused on the graduates of the three high schools in the county, because they believed those graduates would know about the quality of life in the county. Davis says 14 households have taken advantage of the program by buying or building a home in the county. Davis says it’s a win-win situation for everyone as the people who move back get the low-interest loans, the bank gets new customers and the businesses in the county gets people who pay property taxes, send kids to school and shop in businesses. Davis says they have had people with a variety of different occupations. He says people tend to forget that a lot of people can work out of their homes and can choose to live wherever they want. Davis says the first couple to take advantage of the program was a couple from Ames, and their primary job was working out of their home and they chose to move to Franklin County. Davis says the program also helps show the role banks play in communities. Davis says the banking industry in general has been getting a bad rap the past couple of years during the recession, but he says community banks in rural areas have not seen the same problems as the larger banks. He says community banks see themselves as part of the solution and not part of the problem. Davis says they are expanding the program with another one-million dollars. The loans are available to graduates of the West Fork, Hampton-Dumont or Cal Community school districts. Photo courtesy of Hampton State Bank.